Ian Aleksandrovich Nepomniachtchi (Russian: Ян Алекса́ндрович Непо́мнящий, Ian Aleksandrovich Nepomniashchiy; born 14 July 1990) is a Russian chess grandmaster and the 2010 Russian Chess Champion. He was a member of the gold medal-winning Russian team at the 2013 World Team Chess Championship in Antalya and at the 2015 European Team Chess Championship in Reykjavík. Nepomniachtchi won the European Youth Chess Championship three times, in 2000 in the Under-10 category, and in 2001 and 2002 in the U12. In 2002 he also won the World Youth Chess Championship in the U12 category. In 2007 he finished second in the C group of the Corus Chess Tournament in Wijk aan Zee earning his first grandmaster (GM) norm. Later that same year, Nepomniachtchi gained his second GM norm at the European Individual Chess Championship in Dresden and the third and final one at the 5th Vanya Somov Memorial - World's Youth Stars tournament in Kirishi. He won this latter edging out on tiebreak Rauf Mamedov, Parimarjan Negi and Zaven Andriasian, having all players scored 7/11 points. 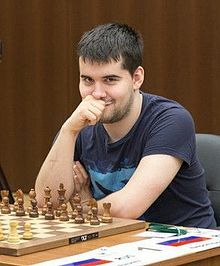 By winning the Aeroflot Open in Moscow in February 2008, he qualified for the 2008 Dortmund Sparkassen Chess Meeting, where he shared second place after being undefeated. In 2010, in Rijeka, he won the European Individual Championship with 9/11. In the same year, in Moscow, he won the Russian Chess Championship, defeating Sergey Karjakin in a playoff. In November 2011 Nepomniachtchi tied for 3rd-5th with Vasily Ivanchuk and Sergey Karjakin in the category 22 Tal Memorial in Moscow. In 2013 he tied for 1st-8th with Alexander Moiseenko, Evgeny Romanov, Alexander G Beliavsky, Constantin Lupulescu, Francisco Vallejo Pons, Sergei Movsesian, Hrant Melkumyan, Alexey Dreev and Evgeny Alekseev in the European Individual Championship. Nepomniachtchi won the silver medal at the World Blitz Chess Championship of 2014 held in Dubai. In April 2015, he won the Aeroflot Open for the second time in his career, edging out Daniil Dubov on tiebreak, having played more games with the black pieces, and earned a spot in the 2015 Dortmund Sparkassen Chess Meeting. Right after the end of the tournament he also won the Aeroflot blitz tournament. Later that year, in September, he won the Moscow Blitz Championship and one month later, he took the silver medal at the World Rapid Chess Championship in Berlin. He graduated from the Russian State Social University.